Today you have been invited to take a house tour at my friend Holly’s home. Holly is a good friend of mine, so luckily I didn’t have to beg too much for her to let us into her home. But, before we go in I want to tell you a little more about her. She wears many hats. She is a wife and mother of two boys first and foremost. 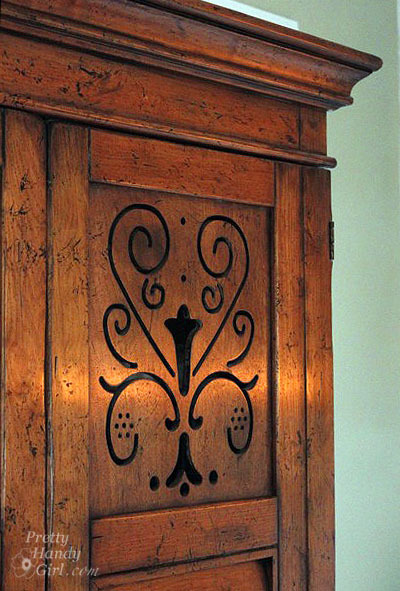 But, she also runs Storywood Designs, a furniture refinishing business and Framed by Storywood, her Etsy Shop. 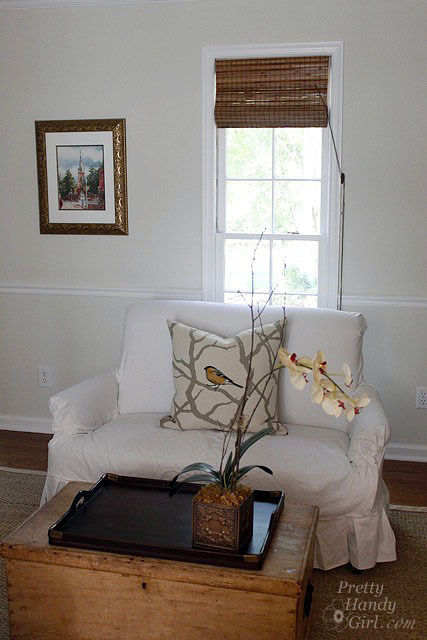 She has a wonderful eye for color and design (which is evident in her furniture pieces and home décor.) When I first walked into her home, I knew I could live there and not have to change a thing. Holly and her husband bought their 1980 home a few years ago. There were plenty of touches from previous owners that she worked with or covered in a creative way. I scanned the real estate flyer (sorry about the quality) to give you an idea what their house looked like when they bought it. The changes they made are phenomenal and yet they didn’t break the bank to do it. Are you ready for the tour? Wipe your feet and come on it. Do you like the initial on her door? She sells them in her Etsy shop! And here is the living room today! 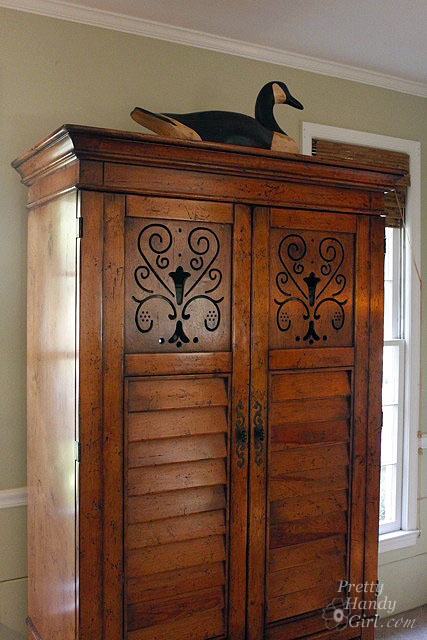 I know armoires are starting to go out of style, but this one is gorgeous with the cut out panels! If she ever tries to get rid of it, I’m grabbing it! They painted the fireplace white and it really brightens up the room. See, I can appreciate a painted white fireplace, even though I repainted ours to look like brick. I love all her fall décor. 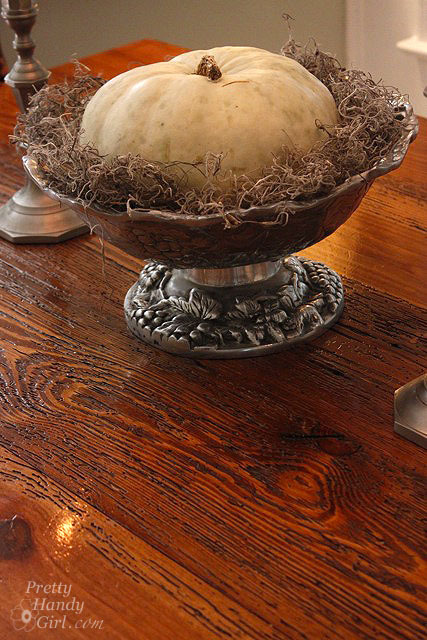 Especially the lit pumpkins on the hearth. Beside the fireplace are sweet built-in cupboards and cabinets with wood countertops. It adds charm to the small niche. Get ready to catch your jaw before it hits the floor. The pendant light adds lots of warmth and texture to the space. Adding corbels under the upper cabinets was a genius idea for adding instant charm. I am itching to do the same thing to our kitchen cabinets. When I do, you can be sure I’ll share a tutorial. Holly and her husband made the kitchen table. The wood was whistling for my attention the entire time I was photographing the kitchen. And with lines like this, how could I help but stare? 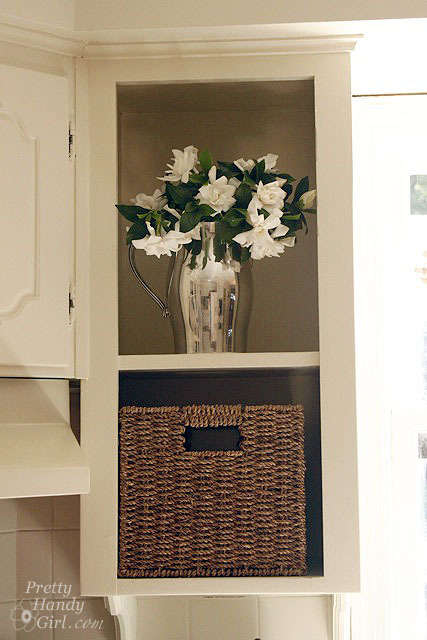 By removing many of the upper cabinet doors they made the kitchen feel larger and more airy. 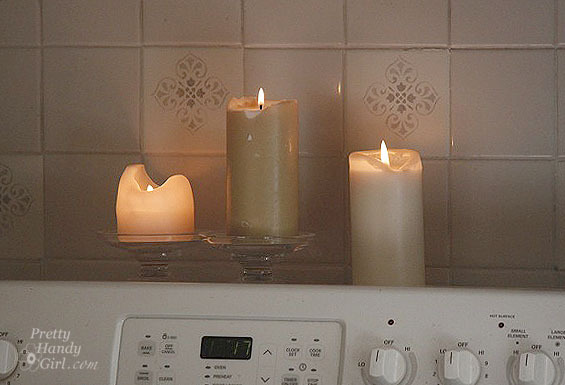 Did you see those little decorative tiles? Would you believe that they had hideous country scenes before. Holly simply painted over the scenes and added a stencil! What a smart idea! Just in case you wondered (because I definitely wanted to know), the base cabinets got a coat of white sage paint by Olympic. (Holly says that Olympic discontinued the color so Lowe’s had to custom mix it in their kitchen and bath enamel paint.) The top cabinets and walls are painted Benjamin Moore Lancaster White. 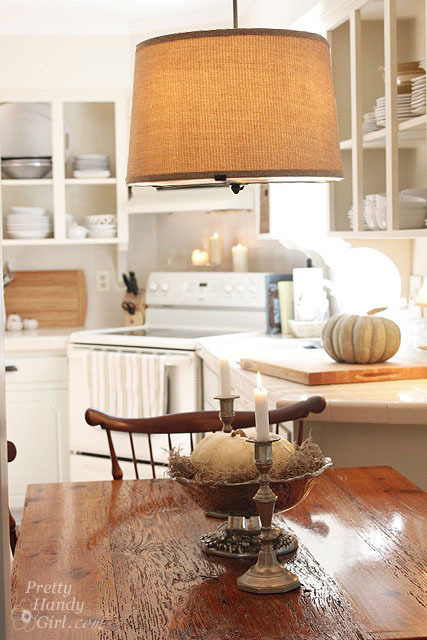 Setting out a little lamp adds some warmth to this corner of the kitchen. The breakfast area has built-in benchs on two sides. The pillows make the space feel cozy. Okay, right this way to the dining room. I really want to display my blue and white china like she has done on this wall. She and I (well mostly Holly) just repainted the room a very neutral gray. I can’t believe what a big difference it made. The china cabinet is a recent refinishing project that Holly just completed. The distressing on this piece is perfect! Check out those layers of paint and glaze. Scrumptious! And the bowed front and curved glass make this cabinet unique. 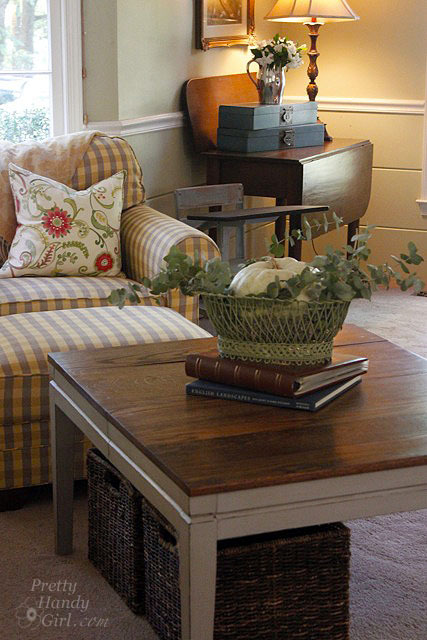 Speaking of distressing, here is another one of Holly’s tables that she refinished. This little table would make a perfect breakfast table or just a side table. It is for sale right now! I’m jealous of her talent. Maybe I can convince her to take me as her understudy. Thank you Holly and family for letting us tour your home. Your hard work really shows in your beautiful home. Hi, your work is beautiful! Did you paint the fireplace or white washed it? I’m looking to update our brick 1980s fireplace. If you can share what you did with your fireplace would be wonderful! I think the previous owners painted it white.